A medical team from the Salmaniya Medical Complex saved a four-year-old boy after he consumed a walnut, which got trapped in his lung. 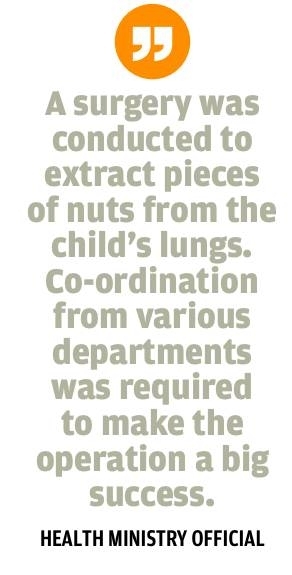 “A surgery was conducted to extract pieces of nuts from the child’s lungs. Co-ordination from various departments was required to make the operation a big success,” a health ministry official said. The success was due to the hard work and coordination of various departments including Ear, Nose, and Throat (ENT) and the chest unit at SMC, the official added. Doctors and surgeons involved in the operation included Dr. Osama Abdul Karim, Dr. Dina Shabib, Dr. Ramzi, Dr. Hussein, and Dr. Hala Radhi.